Simple to prepare, there are only a few ingredients to this recipe but nonetheless it has an incredible depth of aromatic flavour. 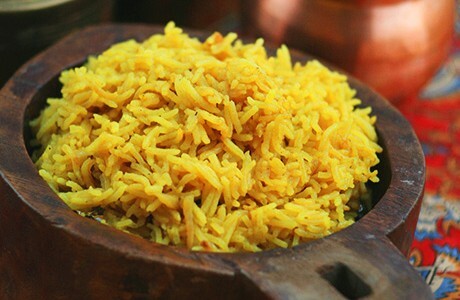 This fragrant rice is delicious served alongside a hot raita or any lentil dish. Heat the butter in a saucepan and once melted, tip in the onions and fry for 3-4 minutes until golden brown. Add the rice and carefully mix well. Fold in the turmeric and salt and add 650ml of just boiled water. Cover with a tight-fitting lid and simmer for 10-13 minutes until all of the water has evaporated. Serve hot with a cucumber raita or any curry or lentil dish.